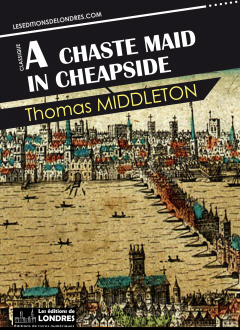 « A Chaste maid in Cheapside » is a « city comedy » written in 1613 by Thomas Middleton. Although it did not turn out to be a major success when presented in theaters in Jacobean times, it is now considered one of the best comedies of the English Renaissance. The play was originally staged by Lady Elizabeth's men. The maid at the center of the story is Moll Yellowhammer, the daughter of a rich Cheapside goldsmith. Her father wants to marry her to Whorehund, whom she does not like, whilst she is in love with a man called Touchwood Junior. Her intended husband has promised one of his mistresses to Moll's brother, whilst he himself is having an affair with a married woman. Then, we are introduced to Touchwood Senior, the elder brother of Moll's love, who has to separate from his wife because he keeps getting her pregnant, and they cannot afford another child. The numerous love and lust stories are all intertwined and constitute the basis of this funny and irreverent play.